Barcode Giant carries all the barcode software you need for barcode label printing and design. Why pay a premium to have somebody print your labels when you can simply buy our barcode labels, barcode printers, and barcoding software from top brands like Seagull Scientific, NiceLabel, Teklynx, and Wasp. Our barcode printing software give you the tools you need to create and print barcode labels of any size, making it easier to manage your product line efficiently. Our barcode software gives you the ability to customize your barcode labels to create and edit the label size, image, color, logo, orientation, and barcode symbology. Check out our barcoding software products below or call one of our representatives for a quantity discount. Software for label printers. Design professional labels. Use and abuse barcodes. Print you labels from your own databases. Speed up label production by smart and proprietary download routines. Interface directly with most of label printers on the market. Handle variable lenght text from databases in small labels with easy and speed. Print labels on roll or page printers. Keep track of your label formats. Use colors if necessary. SATO Label Gallery is a family of professional labeling software products that brings a complete barcode printing solution and RFID Smart Label printing to desktop, mobile and network users. Label Gallery offers an easy-to-use interface and meets any label design and printing requirement for efficient label printing solutions to users in retail, logistics, health care, chemical, automotive and other industries. The product editions come in Free, Easy, Plus and TruePro Edtions. Pocket Label Gallery is available for Windows mobile devices as well as Software Developer Kits (SDK) for either Windows deskop or Windows mobile platforms (.net) using ActiveX functions with Label Gallery Engine components. The Label Gallery Easy is a label design and production suite of software based on an easy-to-use and intuitive user interface designed specifically for SATO printers. 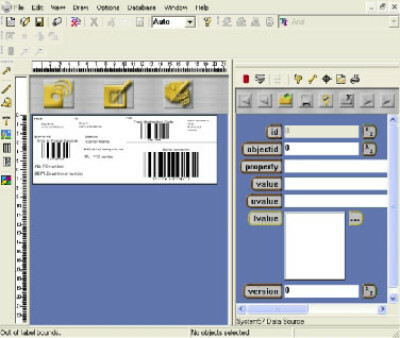 Label Gallery Easy is an entry-level version with "wizard-based" support and capable of generating all industry standard 1D and 2D symbologies. The Label Gallery Plus is appropriate for advanced label design & production. It features data manipulation, integration with external applications via Active X components, RF tag printing on SATO RFID printers, and Logging of print jobs and tracing of variable data. The logged file can be exported for reporting purposes. Lastly, SATO's Label Gallery Plus features automated label printing from external applications via "job files" or command line options. The Label Gallery TruePro is available in single user version as well as in Network version (5,10, 20 & 50 users). Label Gallery TruePro has all the features of Label Gallery Plus but also comes loaded with a stand-alone database program (Gallery Data) and the ability to automate data extraction and processing for label generation, by watching for changes in data that is stored in folders, emails, structured text files, unstructured reports, or other constantly-updated information sources. BarTender gives you total control over your label's appearance, including the type and size of text, barcodes and graphics. Place objects exactly where you want them and control rotation as precisely as 1 degree. You're limited only by your imagination. BarTender Professional contains the features needed by experienced label designers without sacrificing the ease-of-use required by first-time users. Delivers a very wide range of capabilities, including extensive data sourcing. Licensing Information: BarTender Professional licensing is based on the number of workstations on which BarTender will be installed, allowing a defined number of users to print to an unlimited number of printers. This Edition is ideal when one or multiple users are not connected to a common network. BarTender Automation barcode software is the world's leading design and print software for labels, barcodes, cards and RFID tags. Running standalone or integrated with just about any other program, BarTender Automation is the perfect solution for almost any on-demand printing or marking application, including: label printing, print and apply, direct marking on parts and packaging, encoding smart cards, sign production, and much more. Loftware is respected for its quality products, technology leadership and innovative solutions. Looking for the industry standard for bar code software? Look no further, TEKLYNX offers the world's most popular software packages for bar code label design and printing. At Barcode Giant we have a large variety of Thermal Label Printers for all applications. We carry a complete line of products suitable for small to large-scale printing needs. Our product portfolio includes options from top brands like Zebra, SATO, Intermec, Datamax-O'Neil and Printronix. Our printer options include desktop printers, industrial printers, mobile printers, wristband printers and ticket printers. At Barcode Giant you will find a large selection of high-quality printers, fast shipping and a low-price guarantee - if you find the same product advertised for less anywhere else, we'll match it! Search our selection of barcode printers to learn more. Inventory software is ideal for businesses in a warehouse, retail, or small business environment. You can bundle our barcode inventory software with a barcode scanner or other barcode equipment for a complete inventory management system solution. Browse our selection of inventory software below from top brands like Wasp and RedBeam. For a free trial demo of our software contact one of our sales representatives. Automating your business’s asset management to improve tracking, auditing, and reporting of assets is required to prevent money lost from lost or stolen assets. Our asset tracking software allows you to assign responsibility to individuals or locations and keep your assets accountable. Our software gives you the ability to track larger, fixed assets or smaller, mobile assets. We have asset tracking software from Wasp and RedBeam that is compatible with Windows, Android, and iOS operating systems. Don’t forget to get a compatible tablet, mobile computer or barcode scanner with your software. Get instant answers to all your product questions. We love to talk about barcoding!